I was on my way to work one afternoon when I had to pull over due to a flat tire. This was before cell phones were ever invented so I had to walk to the nearest house and pray they let me use their phone to call someone. Thankfully, it was to a little old lady’s house. After allowing me admission into her home, I used her phone and then sat with her in the sitting room waiting for my father-in-law to arrive. “I don’t think so,” I answered thoughtfully. “Because when I pulled over and got out to look, I saw it was flat,” I answered. I thought to myself that he must have thought I was an idiot not to be able to see a flat tire when looking at one. “No, I mean, what made you pull over to check in the first place?” he clarified. Clyde stood shaking his head looking at me in wonder and undoubtedly thinking, yes, I was an idiot. You’d think I would have learned my lesson. Actually I did learn something. When I left home one afternoon to run into town, I came down the old Pennyroyal Road which is quite windy with all the curves and turns. The speed limit is 55 and I minded the limit. Since I’ve been educated and knew from my father-in-law that “going over boards,” meant I likely had a flat tire, I knew I better not pull out onto the busy highway. Thinking quick, as contrary to popular belief, I’m no idiot, I whipped into the empty car lot to my left and got out to inspect the tire. 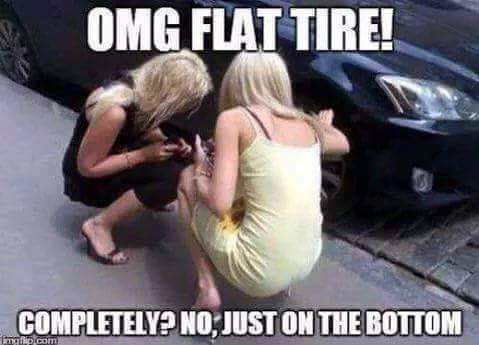 Sure enough it was flat. I walked back to the apartment complex my friend, Eleanor, lived in and used her phone to call my husband, Reese. Eleanor’s son, Bobby, arrived at the same time Reese did. “I thought that was just my driving,” I answered with a shrug. Both men had to sit down.